The 2019 dinner and program is scheduled for April 23rd at Alderson Broaddus University when the Hon. Roger Hanshaw, Speaker of the West Virginia House of Delegates, will deliver the main address. 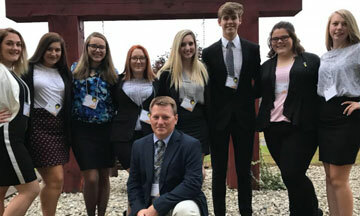 Members of the club, pictured above as they prepare to compete at the FBLA State Leadership Conference in Charleston are, from left. Savanah Hart, Cloie Mosesso, Jordan McGee, Kiara Harris, Kaitlyn Fowler, Ruston Seaman, Haley Mallow, Maela Carr, and, kneeling, FBLA Adviser Gerald Furby. Not pictured are club members McKenzie Carpenter, Riley Domingues, Micah Harris, Cameron Whetzel, and Codey Bailey. The Chamber provides support each year for the budget of the Future Business Leaders of America Club to assist with its educational activities.